Okay you girls, so take a sneak peek at the newest Dominic Jones fall/winter 2012 jewelry collection, rife with statement-making pieces, and get ready to add attitude to your ensembles! Boy oh boy, the goodies spotted in the newest Dominic Jones fall/winter 2012 jewelry collection are definitely some of the hottest we have seen lately. The London-based designer describes his style as being "aggressive but elegant" and admits that he doesn't design for any specific woman. "I enjoy the diversity of people that wear my brand. But I do think that you have to have a little bit of a punk mentality," Jones told the Fashion Monitor. Have a nosey at Jones' lookbook featuring 22-year-old actress Jessica Brown Findlay and Mary Charteris, the niece of Daphne Guinness! Well, we must admit that we were totally mesmerized by Jones' special Victorian-inspired campaign. "The lookbook is very English feeling with Jessica Brown-Findlay (Lady Sybil in Downtown Abbey) and Mary Charteris," the famous designer said. Speaking about Brown Findlay, Dominic Jones told The Telegraph that, "She's a real English Rose. The collection is quite aristocratic and she was a perfect fit, she has a real natural beauty and is really engaging." If you are looking for some seriously covetable stunners in order to add attitude to your ensembles, Dominic Hones is the perfect answer. 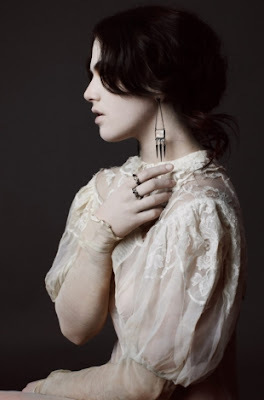 The designer said that the jewelry pieces in his fall/winter 2012 collection represent "trinkets and artefacts that were brought back to the daughters by the Lords that went to fight in the Crusades." "This collection is much more intricate and complex compared to previous seasons. It has a more antique feel in its shapes and forms, worked in with my signature modern approach," Dominic Jones admitted in an interview with the Fashion Monitor.